The new Infiniti G20 reviewed in this issue comes with a remarkable suspension. It is, on the surface, a marriage of the utmost sophistication up front, with ox cart crudeness in the rear. The G20's combination of a multi-link front suspension with a multi-link beam beam rear suspension seems like the Harvard-Phd-meets-prison-work-release mismatch of the century, but is it really? If you look beyond every enthusiast's natural aversion to the word beam, the G20's suspension is actually as close to a perfect match as is possible. Lets try to break the predjusice against the beam first. Beam axle rear suspensions have a deservedly bad reputation for a few reasons. Those schooled in front engine, rear-wheel drive cars draw a connection with solid-axle rear drivers. A solid axle on a rear-wheel drive car must carry the differential and drive axles, so it is exceptionally heavy and takes up a tremendous amount of space between its size and the space it needs to go through its full travel. 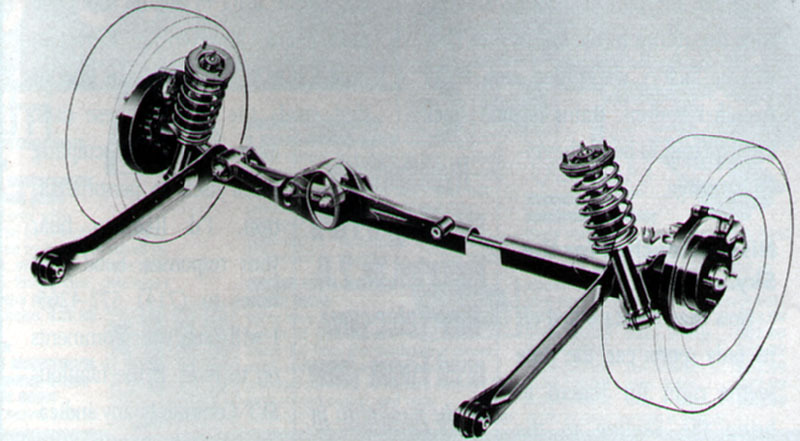 A beam axle on a front-wheel drive car, though, only needs to connect the wheels, so it can be much lighter, and can be positioned lower, since there are no drive axles that need to be positioned at the wheel centerline. The Infiniti G20's multi-link beam rear suspension (the same suspension that resides in the rear of the Sentra and Maxima). Is it really a good performance suspension, or just a clever bit of marketing to pepper the agonizingly dull beam with some of the exotic aura of a multi-link suspension? Those used to front-wheel drive cars are accustomed to beam rear suspensions being used on cheap cars where performance is hardly even on the priority list. Minivans have beam rear suspensons, after all. Beam axles are cheap, basic, and they work well enough for the relatively unburdened rear wheels of a front-wheel drive car. Solid axles on either type of car do have one distict advantage, though. They keep the wheels straight up and down no matter how much the body rolls. Assuming everything else is designed properly, this can be a distict advantage. So what is this "multi-link beam" and what makes it so great? In reality, every beam axle rear suspension must have some system of links to allow the wheels to travel up and down without moving front to back or side to side--the multi-link beam just does an exceptionally good job of it. Nissan's multi-link beam falls under the general category of a twist beam. Front-to-back location is accomplished with a single trailing link on each side that pivots where it attaches to the car, but is mounted solidly to the beam. This solid mounting of the trailing link to the beam means that if the wheels do not move together relative to the car--such as when the body rolls--the beam itself must twist to accomodate the different angles of the two trailing links. So in a twist beam, the beam itself acts as an anti-roll bar. Side-to-side location on beam axles is most commonly done with a Panhard rod--a long link that attaches to the car on one end and the beam on the other. The most obvious problem with this arrangement is that it is asymmetrical. Since the beam is located by a link that swings through an arc, there is a slight side-to-side movement of the beam as the suspension moves up and down. This is not at all good for high-speed stability. Another side effect of the asymmetric Panhard rod is different jacking force depending on which way you are turning. Since conering forces are transmitted from the wheels to the body through a not-quite-horizontal rod, a portion of that cornering force will be translated into a vertical force jacking the back of the car either up or down depending on what direction you are turning. The Scott-Russell linkage used on the multi-link beam has none of the dissadvantages of the asymmetric Panhard rod, and is simpler and more compact than a Watts linkage. Both of these problems can be cured by using a more complex Watts linkage, but those are significantly more bulky, and would take up too much trunk space for a luxury sedan like the G20. Instead, the multi-link beam uses what is known as a Scott-Russel approximate straight-line mechanism. This clever arrangement uses two rods to create a link that moves straight up and down. This mechanism requires that one of the attachment points be able to slide, but since this sliding is over a very short distance, Nissan simply designed a special bushing that is extremely soft in the direction the rod must slide, but stiff in any other direction. So if the G20's rear suspension is just a twist beam with a clever lateral locator link, why the special name? There was a time when every different kind of suspension layout had a name, but that was when there were still relatively few commonly-used suspension layouts, and each could be described with a few words. Then came a new breed of suspension consisting of an assemblage of links, struts, and rods so complex that the few-word description stretched into a dissertation on mechanics. Thus the catch-all term "multi-link suspension" was coined to describe suspensions so complex and exotic that nobody could possibly understand how they work. The multi-link beam name is really just a clever bit of marketing to pepper the agonizingly dull beam with some of the exotic aura of a multi-link suspension. You have to admit, "multi-link beam" does roll off the tongue more easily than "twist beam with Scott-Russel lateral locator link". At the front of the G20, a decidedly more complex suspension is needed to keep the front wheels perpinducular to the ground while allowing for the often conflicting geometry needed for straight-line stability, cornering grip, and compact dimensions. Nissan's front multi-link suspension is closely related to a double wishbone suspension. On a double wishbone suspension, the wheel is held by a hub that is attached to the car with an upper link and a lower link (these links are sometimes called wishbones because of their shape), with the upper link being shorter than the lower link. Assuming they start out parallel when the car is at rest, compressing the suspension will cause the short upper link to pull the top of the wheel in toward the car as it swings through its small-radius arc, while the longer lower link will keep the bottom of the wheel more or less in the same place. The result is increasing negative camber as the suspension compresses, and therefore the wheel staying close to perpindicular to the ground as the body rolls. 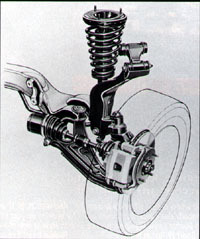 The G20's multi-link front suspension is essentially a modified version of a double wishbone. The changes that were made--the addition of a third link, and the angled position of the upper link--make ususally contradictory geometry goals possible. Each of the two wishbones is attached to the hub with a ball joint, and the position of the two ball joints determines the steering axis. The steering axis is critically important to achieving high-speed stability, reducing torque steer, and providing strong cornering. Designing a suspension with a steering axis that leans back severely (one with a lot of caster) requires mounting the upper arm back so far that it often interferes with other vital components, such as the brake mastery cylinder. Angling the steering axis so that the imaginary line between the two ball joints passes through the center of the contact patch (which is important for reducing torque steer) also requires pushing the upper arm in toward the middle of the car, often resulting in either an arm that is too short, or interference between the suspension and the engine. To achieve the ideal steering axis without causing the associated packaging problems, Nissan developed a third link called, of all things the "third link". Instead of the steering axis being determined by the upper and lower ball joints, it is determined by the lower ball joint, and a shaft held solidly by the third link. The third link is then attached to the car by the upper link, so the third link tilts with the hub as camber changes. With the third link in place, the upper link can then be positioned with much more freedom. One of the freedoms taken with the mounting of the upper link was angling it forward from the car to the third link, at an angle of about 35 degrees. This minor change is an incredibly clever way to make the suspension behave differently during cornering than during straight line driving. To keep the wheel straight up and down on a double wishbone (or in this case a pseudo double wishbone) suspension, especially one with a high degree of body roll such as a performance luxury car, you have to have a relatively aggressive camber curve. When going over bumps in a straight line, though, you don't want the camber changing that much. The angled upper arm solves this problem. With the wheel pointed straight ahead, the upper arm pulls in at an angle as the suspension compresses. This still introduces some negative camber, but some of the movement is translated in to a rearward tilt instead. As the wheel is turned, it comes closer and closer to being at a right angle to the upper link, at which point all of that tilt is camber change. In other words, the camber curve increases the more the steering wheel is turned. Very clever. And as you will agree, the "multi-link" name sure beats "double wishbone with a forward-facing upper link and a third link controlling steering axis and holding the spring and damper". The fact that a beam--even a multi-link beam--is so simple, cheap, and beneficial for such mundane goals an increased trunk space and low road noise, makes it seem just plain wrong to match it with something as sophisticated and mysterious as a multi-link front suspension. They are, in fact, a surprisingly good match. Both the multi-link front and multi-link beam rear suspension layouts have been paired with struts on other Nissans. The current Sentra and Maxima both use MacPherson struts on the front, and the multi-link beam at the rear, while the old G20 ('91 to '96) used the same multi-link front suspension as the new car, but paired it with struts in the rear. Neither combination is as effective as the multi-link/multi-link beam combination on the current G20. For the purpose of this discussion, the most important fact about a simple strut suspension is the fact that as the body rolls, the wheel and tire roll with it. On the Sentra or Maxima, that means that as the body rolls, the front wheels roll over while the rears remain perpendicular to the ground. This gives the rear wheels more grip, accentuating the front driver's propensity to understeer. One of Nissan's reasons for replacing the rear struts with the rear multi-link beam on both these cars was that the increased grip in the rear allowed them to increase roll stiffness in the rear (or reduce roll stiffness in the front), which forces the rear wheels to take more of the cornering forces. This takes advantage of the beam's extra grip, and decreases the burden of the front wheels. Even with the change in roll stiffness, the multi-link beam's grip is underutilized by being paired with struts. On the old G20, the rear wheels rolled with the body while the fronts were held perpindicular to the ground. To prevent this from causing oversteer, front roll stiffness had to be increased (or rear stiffness reduced) to force more cornering work onto the front wheels. The new G20 can share the cornering load more evenly between the front and rear wheels. Drive the G20 hard and you can feel both the front and rear tires being fully utilized in a corner. It's a relatively rare feeling in any front-wheel drive car, but especially one designed to have totally safe handling for even the most ham-fisted driver. While the G20's suspension it its technological high point at the moment, another year may bring even more innovations. The rumor mill is strongly suggesting that the 190-hp SR20VE engine featuring variable valve timing and lift may show up in the G20 next year mated to a unique continuously variable transmission with a sequential six-speed shifting option. These rumors are so strong, in fact, that we would almost call them definite if it weren't for Nissan's recent streak of anti-enthusiast product line changes. The current G20 is a strong hint that things may change, so be ready for a wild high-performance G20 next year.